Yeah, duh, there’s gonna be spoilers below. This one is sort of long, but I hope you can read it through. Or don’t, I’m not trying to pressure you. The 1.6 is for Part One, Chapter 6. This is the moment I had been waiting for. FINALLY IT HAPPENED. But I’m getting ahead of myself. So they-Meursault, Marie and Raymond-are on their way to Raymond’s friend Masson’s beach house, They see the Arabs that have been following Raymond around, but the Arabs are seemingly not interested in seeking revenge on this particular Sunday. They ride the bus and cross “…a small plateau that overlooks the sea and then drops steeply down to the beach” (Camus 49). Honestly, with the following descriptions, I was having a tough time visualizing the beach. Okay, so no lie, when it said “Masson wanted to go for a swim, but his wife and Raymond didn’t want to come” (Camus 50) I got all excited cause I thought Raymond was going to hit on his wife or coerce her into the pimp business, and then they’d come back and Masson would try to kill Raymond or the other way around. But nah, nothing of that sort. More couple-ey swimming hoopla, and notice the lack of importance for Masson’s wife-we don’t even know her name. But, yanno, women. When the three men take their walk on the beach, they meet the Arabs walking toward them. As they’re fighting, Raymond tries to be all macho and idiotically turns from his victim to Meursault to tell him he’s “..gonna let him have it now” (Camus 54) and subsequently gets slashed with a knife. So then the Arabs back away and leave, and Masson takes Raymond to a doctor nearby. When they get back to the house, Raymond is acting funny and says he is going down to the beach to get some air. Despite being swore at and told not to follow, Meursault accompanies him, like any friend trying to keep another friend out of trouble would. They find the Arabs by a spring (again, I had trouble visualizing this setting), and Raymond asks if he should “…let him have it” (Camus 56). Meursault, in a way, calms the situation by telling Raymond that shooting the Arab when he doesn’t even say anything would be lousy. When Raymond wants to call him something and if he answers, to shoot, Meursault puts meaningless restrictions on the event, first saying that he can’t shoot if he doesn’t draw his knife, then informing Raymond that he should take him on man to man. For some reason-I suppose he wants to uphold his manly honor-Raymond submits to Meursault’s restrictions and hands Meursault his gun when he asks for it. They have a little moment as Raymond hands him the gun, and simply stare at each other. “It was then that I realized that you could either shoot or not shoot” (Camus 56). I noted it as an interesting observation, a very black and white type of comment. In context and referring to a gun, of course it’s true. However, there are minutiae that make a difference. Do you shoot at the head, the heart, the stomach, a foot, a limb? What damage do you intend to do? Then again, in the eyes of the law, it comes down to if you shot the person or not. BUT then again, court does take into consideration premeditated hoopla, and there is a difference between murder and injuring someone, unless malicious intent is found. Honestly, this argument is only valid if you’re efficient at shooting a gun and can actually aim. They go back to the bungalow, but Meursault stops short of the steps, and he is….”unable to face the effort it would take to climb the wooden staircase and face the women again. But the heat was so intense that it was just as bad as standing still in the blinding stream falling from the sky. To stay or go, it amounted to the same thing” (Camus 57). So he goes for a walk in the blistering heat. He heads toward the relief of the spring to find that Raymond’s man (singular, so there’s only one there) had come back, and he”s just sunbathing. They see each other and each grab the weapons in their pockets, though the Arab lays back down with his hand in his pocket, glancing at Meursault every now and then. So Meursault just stands there in the scorching sun. He begins to think about how this day is a lot like the one he buried Maman in, which makes me wonder if he had any sudden pang of shock or grief or something related to Maman’s death that triggered this unreasonable event. Anyway, he keeps saying how hot it is, and he starts to move forward for no apparent reason-“I knew that it was stupid, that I wouldn’t get the sun off me by stepping forward” (Camus 59). But he keeps advancing, and the Arab draws his knife and slashes Meursault across the forehead and over his eyes. It’s a very descriptive, well written paragraph describing the heat and sweat and blood over his eyes (which I will rewrite, despite how excessive it is). …So he shot the guy because it was hot. That is what I gathered from this. This was the moment I threw down the book on the table where I had been taking my break so some of my friends could stare at me. That bold part is my favorite part of the whole spiel. I’m still lurking on the edge of the whole juxtaposing the heat of Maman’s funeral with the heat of the day of the murder. There’s something important there. When he says that he shook off the sweat and the sun, was he shaking off grief and insensibility, finally coming out of his daze? I think so. Then there is the big question-why did he shoot the Arab four times after he had killed him? I will do some literary research on this whole murder scene and hopefully be back with more answers! Thanks for reading, if you’ve gotten to this point-it was pretty bulky. Part 2 is next! Spoilers are presumably abundant below. I haven’t been keeping up with doing these blogs posts about my summer reading book (because it does help me go over the chapter, and I’ll have them to refer back to later), and because Chapter 6 is such a massive, important chapter I’ve decided to do that one on its own and do chapter 5 in a separate post. Meursault, Meursault, Meursault, what am I to do with you? His passivity kills me sometimes. His conversation with his boss, after his boss conveys he believes life in Paris would allure Meursault, is worth re-writing. “I said yes but that really it was all the same to me. Then he asked me if I wasn’t interested in a change of life. I said that people never change their lives, that in any case one life was as good as another and that I wasn’t dissatisfied with mine here at all” (Camus 41). I disagree that people never change their lives; however, it demonstrates existentialism, that people do not really control their lives. As far as one life being as good as another, that is very debatable, and I’m not quite sure what to think of that statement yet. “…I couldn’t see any reason to change my life. Looking back on it, I wasn’t unhappy. When I was a student, I had lots of ambitions like that. But when I had to give up my studies I learned very quickly that none of it really mattered” (Camus 41). I believe the key phrase here is when he says “I wasn’t unhappy”, not “I was happy”. Similar to his passive nature, Meursault displays a contentment and “okay” attitude toward life. It might not be great or even good, but it’s not bad. The scary thing is that this sounds exactly like my one friend, and this type of attitude makes me sad. He and Meursault are quite alike. He is very non-feeling about a lot of things. I hold happiness in the highest esteem, greater than achieving any goals of greatness, and I’m always afraid he’ll never be truly happy. I know most people aren’t truly happy, but they at least have something that makes them joyful on a regular basis-family parties, friends, hobbies, vacations, etc-and he doesn’t seem to have a lot of those. Well, that might be a lie, he does thoroughly enjoy quite a few activities. It’s just that he’s so I-don’t-care-about-myself and I-don’t-want-to-be-a-burden that I feel he’ll never pursue what he loves, which is what I think life is all about. I’ve found lots of people have lost ambitions and dreams from their youth, and though this also makes me quite depressed, I understand it’s a part of life. Notwithstanding this, many individuals attempt to strive for the best in what they have, and my friend and Meursault are also alike in the way that they do not endeavor in this way. AH scary thought. No I don’t think I’d marry someone who flat out said he probably doesn’t love me. I don’t mind passivity, because I can deal with it and want to be there for my friend, but in matters of the heart, passivity is a no-no. And I don’t think my friend is like that. Oh yes, so marriage isn’t a very big deal apparently. Didn’t these two just start hanging out? And uh, what’s with the little old lady and Meursault following her? Stalker much? Just like, you seem someone peculiar, and your first thought is to follow them around for a bit? More of Salamano and his sad dog story. I was squeaking throughout Meursaults life story. Another thing that makes me sad is when people marry people and then realize they don’t really love them and end up not happy. I want so desperately to avoid this. As they say in Rent, “I’d be happy to die for a taste of what Angel had-someone to live for, unafraid to say I love you” (Larson). Yanno, hopefully death can be avoided, but I really don’t want to end up in one of those marriages. I really wonder if Meursault truly feels guilt for having to put Maman in a home. I mean, like he states, it’s the reasonable and proper thing to do, and I completely understand that. But to me it sounds like a situation similar to having to put your dog down-you know it’s what you have to do, but you really don’t want to do it and feel sad about it. I mean, considering his personality, I doubt he does, but I like to ponder. “He [Salamano] gave a little smile, and before he left he said, ‘I hope the dogs don’t bark tonight. I always think it’s mine'” (Camus 46). Insert doggy sadness here. Any thoughts about the book or any of the quotes or whatever is always welcomed. In completely unrelated news…yesterday I got my first paycheck from paint crew-$156.80! It honestly felt pretty good. There is definitely a likelihood of spoilers below. First I have to say that today on Bloom’s Literary Reference Center, the author of the day was Chinua Achebe, and I had to spaz a little. I’m still waiting for the senseless murder. Where is it!?! I want it now. I actually took some initiative and read over the weekend…on my own…in my house. Usually I’m an avid reader, but when I get assigned books it turns to blech. Is there significance in the towels, which Meursault doesn’t like in the afternoon because it is soggy? Is life like a big soggy mess that every now and then gets changed out so it can be clean again, only to become moist once more? Though I am a fan of reading WAY too much into a book. I do think that this is one of those novels where you don’t read it for the plot line but for the message or theme behind the story. I do like those kinds of books a lot too. And uh I hope it’s not a typo in my book, that would be awkward, but it says the sky is green. Does that mean something about the surrounding landscape, that it was lush and green and merged into the sky? That’s what I’m assuming. The whole dog thing made me whimper, because I love my doggy (if you’ve been here before you might have seen his pictures in a previous post). Meursault and his passivity. “Celeste is always saying, ‘It’s pitiful,’ but really, who’s to say?” (Camus 27). Anyway, anyone else notice the juxtaposition of Salamano’s dog and Raymond’s mistress? At least in this chapter. 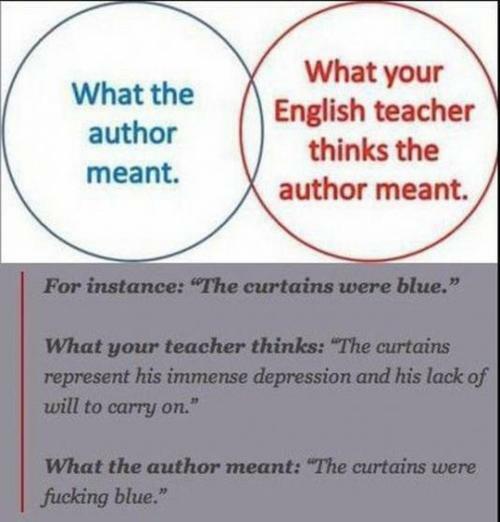 To me it demonstrates the position of women, though I don’t know if that has much to do with what the author was trying to convey. This woman is silly for thinking that just because her and Meursault slept together he loved her. Silly silly Marie. Again, more of Meursault passivity when he doesn’t want to get cops because he said he doesn’t like cops, but then again, in that situation, I’m sure a lot of people would be anxious about being the one to summon the police. Funny how everyone just sort of stands there listening to the chick getting beaten. Probably my favorite quote from the book so far. “Raymond asked, ‘is that legal, calling a man a pimp like that? '” (Camus 36). I was in work when I was reading this and I burst out laughing. “He thought so too, and he pointed out that the cop could do anything he wanted, it wouldn’t change the fact that she’d gotten her beating” (Camus 37). This is one of my unsolvable problems with the world. It’s like I’m helpless sometimes. I thought this was a really meaningful quote. Aw, and then old Salamano really loves his dog. I awed in the middle of lunch break and puckered my lips like a lil puppy dog at this. So sad and cute but really mostly sad. I should read on to find out if he gets the dog back (if it’s mentioned at all again), because I really want him to get his old scabby dog back! Spoilers may or may not be included. These thoughts are entirely of my own brain and have not been supported with literary criticism of any kind. I actually got somewhere in reading today. Chapter 1 was just sort of there for me; however, this makes sense. When a tragic event occurs, there are a number of stereotypical methods individuals utilize to cope. One of the most stereotypical is numbness, which includes a blockage of emotional response. You really don’t feel anything. Meursault relates that upon reaching the village, “..everything seemed to happen so fast, so deliberately, so naturally that I don’t remember any of it anymore” (Camus 17). However, he then goes on to recall several images or insignificant events, such as the tears covering Perez’s face or the dirt being poured over Maman’s casket. In my experience, this seems to go along with the idea of numbness and distance from reality. There was also a hint of existentialism in the chapter. “She said, ‘If you go slowly, you risk getting sunstroke. But if you go too fast, you work up a sweat and then catch a chill inside the church.’ She was right. There was no way out” (Camus 17). This is applicable to many lose-lose situations. One way or the other, you suffer, lose, or fail. In this way, the laws of nature are already defined and no matter what action is taken there will be a negative outcome. Though there is the illusion of free choice, in this case, in the speed of walking, and there are two results of either sunstroke or chills, the conclusion is predetermined. Now, onward to Chapter 2! This was a fairly better chapter for me at least. I can sympathize with Meursault’s aversion to Sundays; I don’t enjoy them either, and a lot of times I get in my morose moods on Sundays, and these moods can follow me into the week. One can recognize Meursaults passive nature when he understands his boss’s distaste for giving Meursault Thursday and Friday off, therefore giving him a four day break. To deal with Maman’s death, Meursault transitions from numbness and disassociation to distraction, represented by his one night stand with Marie. He then passes a depressing Sunday afternoon home alone, people watching. I regarded this as more evidence of existentialism. The impression given was that this type of behavior, from families taking walks to teenagers going to the movies and flirting, is all typical. The scene in the streets is just another representation of the flow of nature and an individual’s position watching from the sidelines. Meursault cannot change the stream of people, or lack thereof, just as he cannot change the events occurring in his own life, including Maman’s death. ” …I wandered around the apartment. It was just the right size when Maman was here. Now it’s too big for me, and I’ve had to move the dining room table into my bedroom. I live in just one room now….I’ve let the rest go” (Camus 21). I believe this shows that Meursault does feel some sadness from the death of Maman, or how he wasn’t close to her. For me, this quote insinuates that the world is big and empty when one is alone, and obviously Meursault feels lonely. He seems to be that type of person who really just rolls with everything; goes to work, sleeps, goes to work, has a cigarette, sleeps, goes to work, sleeps with a girl, etc. I really liked the second chapter’s conclusion. “It occurred to me that anyway one more Sunday was over, that Maman was buried now, that I was going back to work, and that, really, nothing had changed” (Camus 24). Meursault returns to his passivity to deal with Maman’s death. He was isolated from her before because he never really visited her; nothing has really changed. Besides, what could he do about it? He’s just rolling with the stream of life. Really, an excellent, excellent way to end the chapter. “Welcome to Whose Line Is It Anyway, where everything’s made up and the points don’t matter. That’s right, the points are just like Friday afternoons at work” (Drew Carey). This was pretty much me today. I was very excited because I signed up for a campus tour and information session in Johns Hopkins University in Baltimore, which is probably my number one choice right now. My dad keeps telling me how great TCNJ and BCC are, trying to coerce me into being both local and cheap. Yesterday I went to a college information session about the University of Chicago, which I was also considering for sciences. It was at Princeton Library, and the neighborhood was just so gosh darn cute I’m thinking about looking into Princeton too (assuming I could get in, I probably wouldn’t) if I decide to major in an English related major. When I mentioned this to my mom and dad they both said I would have to commute because I can’t afford Princeton for four years. Am I the only one who really really really wants to live on campus despite the costs? Not just because I want to get away (I want to be generally close to my family when I go to college) but because I want to be able to be more involved in the college events and activities. I’m hoping that the coming year will further help me decide the direction of my life as far as college and majors are concerned. Last year, taking AP World History and my complete failure at procuring a spot in the NJ Scholars program revealed that I didn’t really care too much for the social sciences or history. I was able to get a group interview for the Scholars program, but then they started asking about austerity and the economy. And I was just like…uh…. You don’t realize how terrible it was. I don’t even wanna share the stupid things I said, but at one point I literally told them “I don’t know”. Because I truly didn’t! And everyone else was just throwing in economic terms and making arguments and actually knew something about the economic state of the nation. After about five minutes I knew I wasn’t getting in (and I was right). But my friends have told me that only one other student (majoring in English) has survived AP English and still enjoyed English class. If it ruins in for me, I know I should delve into the sciences. Otherwise, I may seriously consider a career in writing. I’ve been bringing the book to work with me, and have only gotten to page 16. Have I ever mentioned I’m a slow reader? Right now I’m still reading about the funeral procession. The whole thing seems a little shady to me, but that could just be because the back of the book said Meursault gets involved in a murder (accidentally) and I’m waiting for it. I think my slow pace has to do with the writing style. The short sentences and quick nature of the book slightly boggles me, and I keep finding myself going back to re-read sentences because I feel like I’ve missed something. So far I haven’t seen anything having to do with existentialism. Meursault is very curt and I haven’t really figured him out yet. 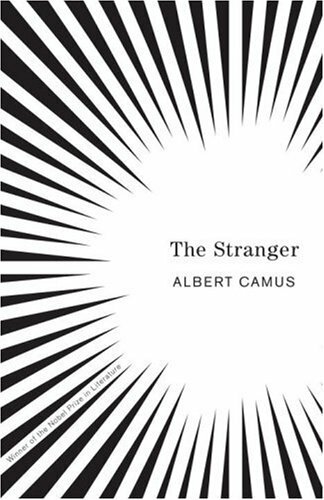 For AP English next year, which I am taking, we are required to read The Stranger (L’Etranger) by Albert Camus, and because I’ve been so busy with work, soccer, friends, family and other obligations I’ve started to bring my book with me to work and reading on my half hour lunch breaks. First of all, I love this cover. This makes me curious. So far I’m only up to page 7, and Meursault is just at the old folks home sitting vigil at his mother’s funeral. Not too much information so far, other than plot line. I do not have any real opinions on the book yet, though I think I like the writing style so far. Posting a reading discussion with myself, depending on how far I get each day and if I have time to blog, could become daily. Check back tomorrow to see if I write anything else about this novel.